I wanted to turn back time. If only i could have a couple more days to extend, i would. Nepal is such a great country to travel to. And as i type this in the comforts of my home here in the Philippines, i recall the fantastic moments of my last few days in the country. I remember waking up really early on my last day. I knew i would not be spending another day, but only a few hours in Kathmandu. I went up to have my favorite special breakfast at the roof top of Kathmandu City Hotel. I talked to the waiters and cooks who work tirelessly to ensure i have something to eat first thing in the morning. I told myself i will never leave without us having a photo opportunity. To Shree Krishna, much appreciate bro the excellent service. Others may don't like the idea posing in front of the camera, i'd like to think otherwise. When you've traveled a thousand miles away from home, and meet the most beautiful people, i reckon you would do the same. I left Philippines with two bags, i am leaving Nepal with five. As i went to the bank with Shiva to pay for my accommodations, i checked out a couple more shops to buy another bag so i don't end up having too many bags. I would rather have one oversize bag so as to ensure i don't lose them. Before i left, i said goodbye to Lamsal, Shiva and Ramhari. Lamsal gave me a Kata, which is a traditional Tibetan scarf given to guests during departure to ensure a safe voyage. Shiva vowed to connect with me on Facebook so i can meet my future wife. I kept the Kata with me, and waved my last goodbye to the awesome people of Kathmandu City Hotel. I rode the taxi going to the airport, and yet meeting kind Nepalese people never ends. My driver was friendly and honest. Again, the usual conversation piece of Jerik Gurung re-appears. And the thirty minute ride to the airport was hassle-free and a whole lot of fun. I arrived at the airport and smoked my Surya for the very last time. The line going inside the departure terminal was less manic than my last time. With a couple of foreigners snaking their way to get ahead, i stayed put. What's the worse that couple happen, not making in time for my flight? So be it. I have learned to accept the worst and welcome the best in Nepal. Staying for a few more days would be a delight for me. Sadly, I made it in time. Even though, i fell in a line that never seem to move. Many local people come meet their friends who're in line so they get in line, too. I've learned to accept that in any transportation hub in the country. Falling in line is only a suggestion in Nepal. I weighed my bag at the check-in counter, and realized i was still a few more kilos overweight so i had to take out some stuff from my check in. I always fly Thai Airways leaving Kathmandu because at economy i get 30 kilos check-in baggage. Remind me to fly Thai Airways again, this time going to Nepal. I was seated on the left side of the plane but not on the window seat. I picked this seat because i wanted to check out the view of Everest for the very last time, hoping the passenger on the window side is kind enough to let me take photos. Good thing, i was a seated to an old chap from Melbourne. And instead of watching a film on the 7 inch screen, we talked about his girlfriend from Kathmandu, the bar he works in Melbourne, and his few hours transit in Bangkok, all this while we were enjoying our food. Once in a while, i would capture a couple stills of the himalayas. It didn't take long before i arrived at Suvarnabhumi Airport. After the three hour flight, that was the only realization point that i have already left Nepal -- my favorite country in the world. Let it be known here, Thailand is one of my personal favorite countries in South East Asia. Having visited the country more than seven times now, i feel relaxed because i know may way around Bangkok. The only thing i have forgotten to do was to exchange my Nepali Rupee to US Dollar. I have about ten thousand with me, and it was regretful that when i arrived in Bangkok, no bank would like to exchange my money. Up until now, i have no idea why. I remember exchanging my rupees last year at the very same airport. As i pick up my baggage, i was left with a very crucial decision. I relatively had no money with me, at the start of my almost a week long trip to Bangkok and then to Bandar Seri Begawan, tired and hungry. I phoned home and asked for help. I left my baggage to keep and sprinted my way to Paya Thai via the city train. It only takes less than an hour, and 45 Baht to get to the stop. From there, i rode a tuk-tuk for 100 rupees. Last year, i rode a motorcycle paying the same amount. It's already a bargain, considering i am in Thailand already, and the Thai tuk-tuk drivers are the most aggressive in the world. I chanced upon a very quiet yet honest uncle to bring me to Khao San Road safely. Of course, I've had enough of the infamous street but i liked the location's convenience. I roamed around Rambuttri and checked in at a hotel called ViengTai. It's my most expensive stay yet after two months, but for the night, i wasn't hesitant at all. What helped me decide to stay is the staff whom i talked to; one spoke Filipino and the other guy was very helpful. I had a few hundred bahts with me which i spent eating barbecue on the road side while enjoying beer. It was a very long day, and a good sleep was something i was looking forward to doing since i arrived at the airport. I woke up the next day well-rested, and hungry. Good thing, i had buffet breakfast waiting for me at the lobby. After eating a ridiculous amount of pancakes and fruits, i was off to check the pool. It was a bit of a maze finding where it is actually. But discovering no noisy farang in sight made my morning extra wonderful. That's when i realized, i was staying at a fancy hotel. Having spent a lot of time in Khao San Road in the past seven years and staying at the seediest places, it felt weird that i had this bit of luxury, now when i don't have enough cash with me. After a good shower, and putting a fresh set of clothing, i found myself walking around Khao San. A few minutes later, i was already drenched in sweat. I manned up and walked until i reached the junction towards National Stadium. 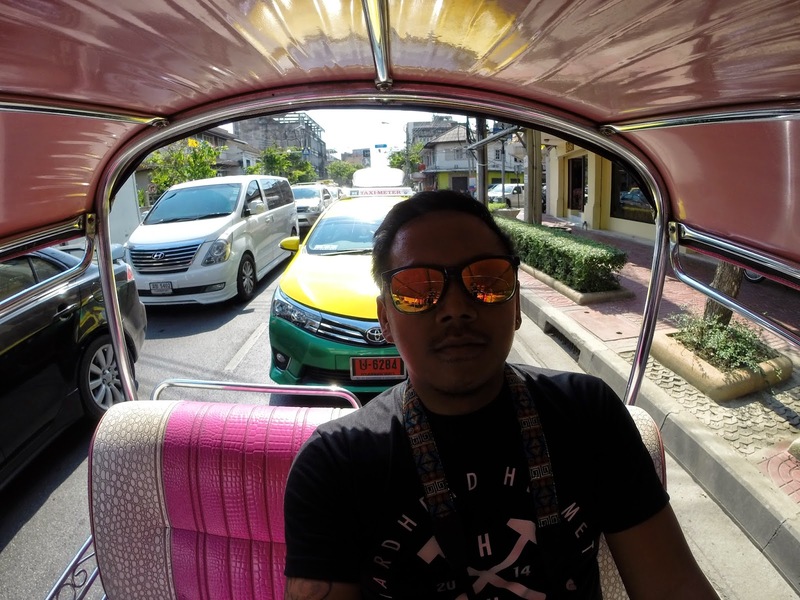 The humid afternoon of Bangkok totally killed me, so a tuk-tuk ride again was necessary.